An excellent way to mix slow and fast-moving items in the same storage footprint. Overhead pallet bulk storage easily transfers to active operation later. 3-shelf and 4-shelf units, with 4-pallet or 8-pallet overhead storage. Modules include roller conveyor extending the entire length of the flow rack. Allow pickers to move down the lines without cart or truck. Lower flow shelf is flush with the conveyor. 3-shelf and 4-shelf units; 4-pallet or 8-pallet overhead storage. Pallet racks that utilize carton flow tracks are an excellent way to mix slow and fast-moving items in the same storage footprint. With overhead pallet storage, bulk quantities are easily transferred to active operation later. Placed along a line of conveyors, or used with cart-based picking, flow racks provide a solid wall of pick faces operators can quickly access to service incoming orders. Gravity flow modules work best for multiple-item orders, when average supply holding time is minimal, and when item weight is important. First-in, first-out (FIFO) storage gives you automatic inventory rotation. Whether you need a bay or two of flow storage or a long row of gravity-driven pick faces with pallet storage above, utilizing rack-mounted flow storage gives you the flexibility to change and reconfigure as needed; add, move, or remove flow shelves when you want, all within your pallet rack bays. Note: To ensure stability and integrity, assembled pick modules should be anchored to the floor upon installation. We can create different sizes and configurations to fit your exact application. Call or submit a carton flow inquiry for more assistance. 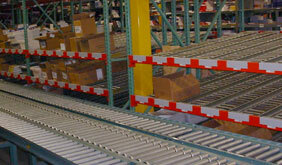 Low-Profile carton flow track nests between the front and rear pallet rack beams by use of hangers, providing full use of vertical space and smooth carton flow.